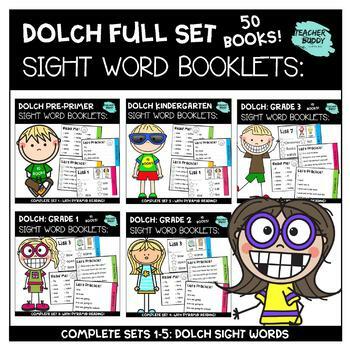 We are THRILLED to offer you this incredible Dolch Sight Words Bundle! It has ALL you need to get your kids reading beginner books in record speed! Your little learners will plow through the standardized Dolch lists for each grade level. 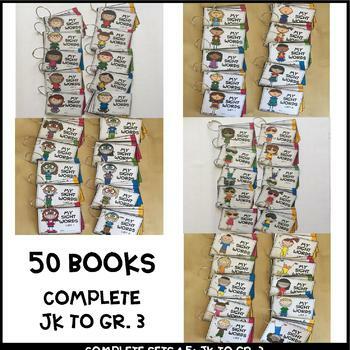 Divided into a massive pack of 50 sequential booklets - highlighting 6 Dolch sight words each - each book has multiple scaffolded reading activities like pyramid reading, reviews, and word searches. Every card is designed for struggling learners. The booklets progress to set them thoughtfully up for success. You’ll see your kids’ confidence soar as they realize they can read the full sentences easily since each book uses ONLY newly introduced or review words. Set in manageable amounts, the fun format inspires young readers to master each list. The cards have stars for new words and smiley faces for review sentences. Learners find it rewarding to check off a new word they know or cover it with a sticker. Colorful certificates can be printed for motivation and reward opportunities. As a bonus, we’ve added flash cards to get them started and a Teacher Tracking Sheet so you can easily keep track of each students’ progress individually or as a class. Each book adds 6 new words and reviews previous booklets. Each set also builds on the next. 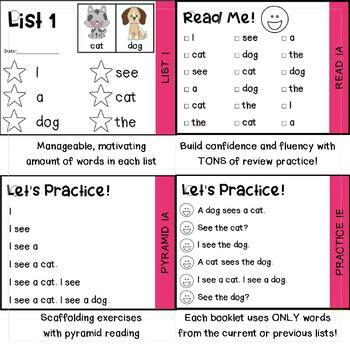 The format is perfect for reading through at home with parents, as laminated ring booklets for literacy centers, or as personal checklists for students to take control of their learning. You may also find them helpful for guided reading warmups, small group work, and more! 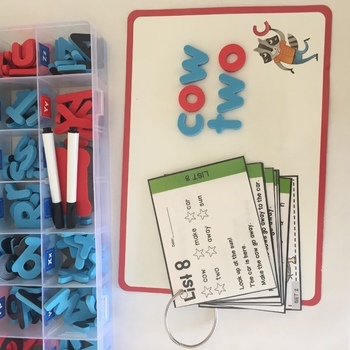 As an extension activity - have learners lay magnetic letters in order to spell their sight words. Then write it with a dry erase marker. We also sell this magnetic set on Amazon, so check out our website (below) if you would like a set! I’m always glad to hear from you if you have any comments or questions!